You know how sometimes you start a project and then you fall out of love with it? Sometimes it just doesn't reach the vision you had for it. That was the case with my Virtual Quilting Bee project that I started two year s ago. I think I got too ambitious thinking I would make 4 version of each block, two with prints and two with solids. After about block 8 or 10 I put it aside. This year I pulled it out and decided to make a few more blocks of my own choosing to add to it. And guess what? I love the way it turned out. 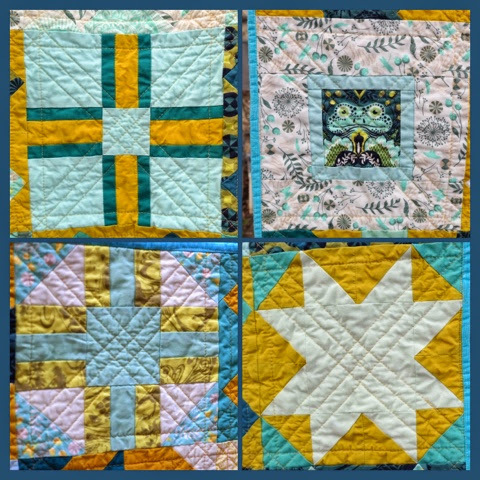 I knew I liked the Prince Charming fabrics by Tula Pink, and the solids I chose to compliment it were just a mix of favorites and "so not me" colors that they were crazy enough to make this quilt sing. 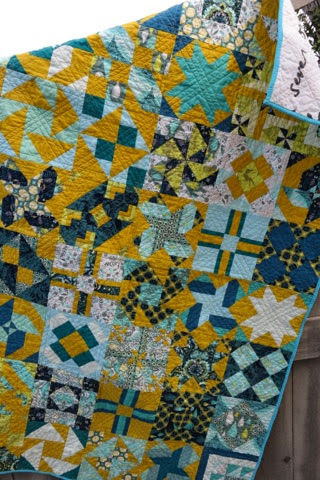 I quilted it with straight lines a half inch from each seam line of the 8" blocks, both vertically and horizontally and then I added three diagonal lines going through each block, in both directions. 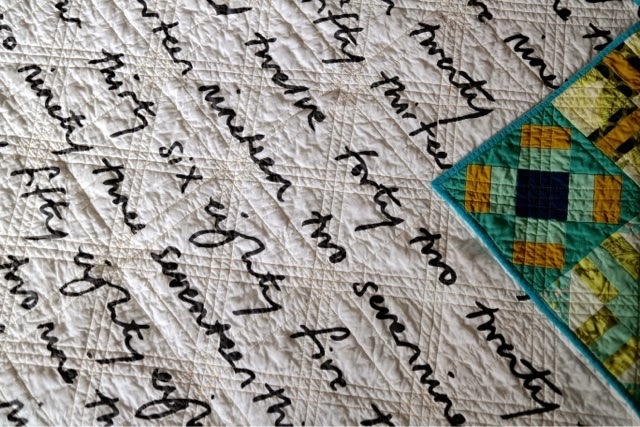 I think the quilting is one of my favorite parts of this quilt. The Honey colored thread was a perfect choice for the quilting. It blends in on the yellows and mid-tone colors and doesn't contrast too much on the whites, dark blues and lighter colors. And seriously, those frogs are just too cute. You can really see the texture in this photo. I really like the way the mustard yellow compliments all the shades of blue. 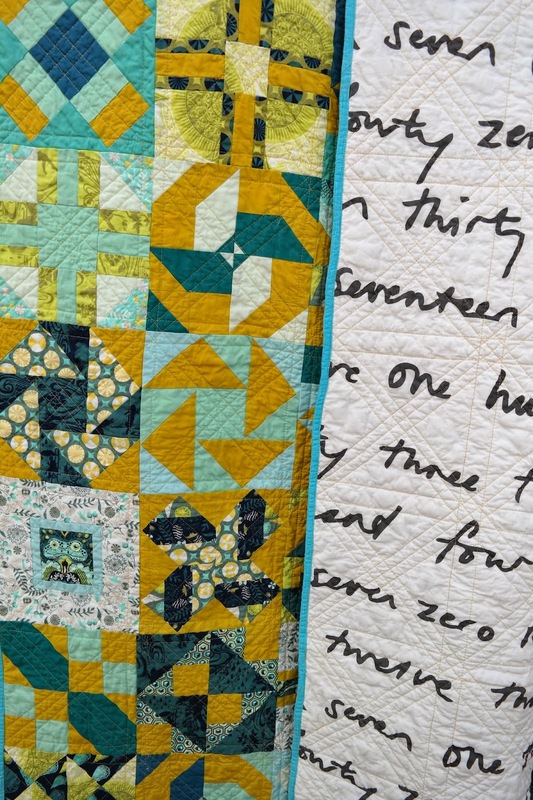 To calm the riot of color and pattern on the front of the quilt I used the quiet Nummers print from IKEA on the back and bound it with Sketch in Aqua. For me, what I thought of as a quilt I would never finish, turned out to be something I am proud of and will happily give as a gift. I have two friends who are expecting babies this spring, now I hope one of them has a boy, because this Prince Charming needs a new home. Thread: Pieced with Auriil 50 wt. and Quilted by me with Perma Core 40 wt. in Honey. Finished Size: 45.5" x 61.5"
This is my first finish of the year and the first finish on my 2015 Finish Along list. 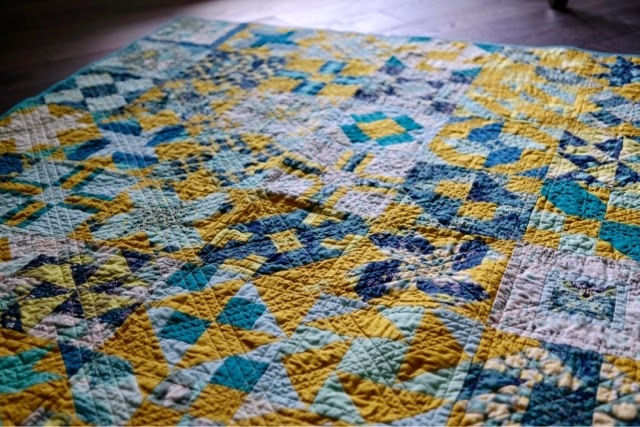 I love the colors of this quilt so much! And the little frog frame block is just perfect. I hope you have someone to give it to soon; it's too pretty not to use! I just love this quilt. 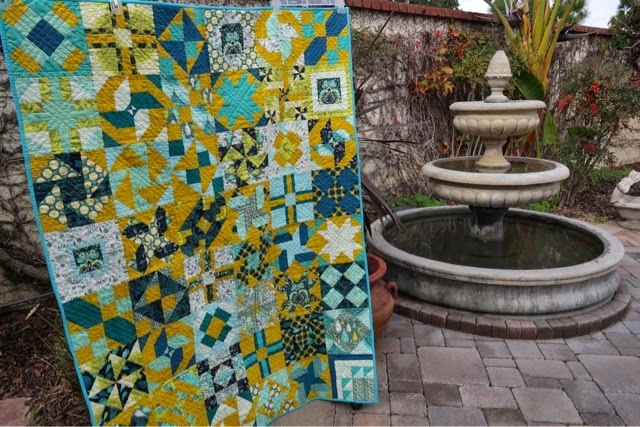 I love teals and aquas and mustard together. 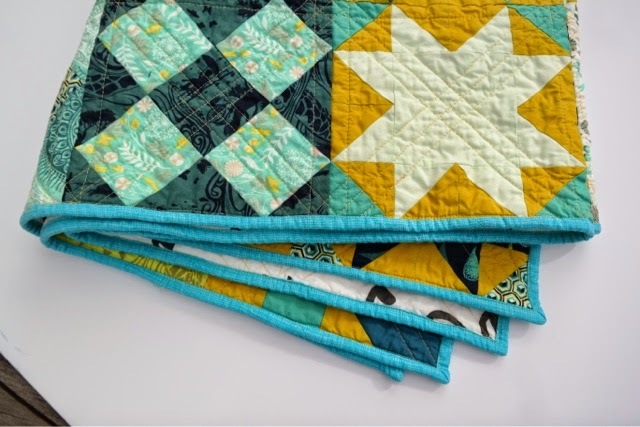 The quilting is a perfect compliment for this quilt. Love it! Prince Charming is one of my all time favorite lines! This turned out beautifully ! Personally I love these colors together. See I think these colours are very you. Well done for seeing it through and it will be a beautiful gift for a baby. 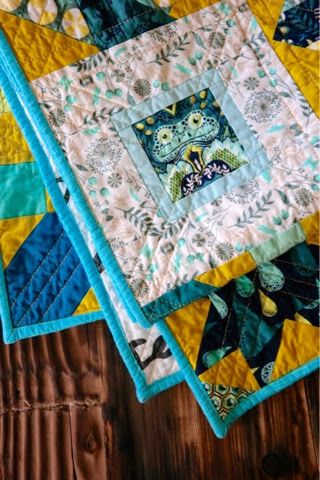 Love the this quilt and especially the name! It is wonderful when we pull something out and fall in love with it again. I am hoping that will happen with some of my ufos this year. Truly lovely! The colors are spectacular, very nice indeed!